Home » » PHOTO OF BOY WHO FELL INSIDE POT OF BOILING WATER FEW DAYS TO HIS BIRTHDAY IN BAYELSA. PHOTO OF BOY WHO FELL INSIDE POT OF BOILING WATER FEW DAYS TO HIS BIRTHDAY IN BAYELSA. Woyintari, a baby boy has ended up suffering really horrific burns on the back, buttocks, legs and parts of his pubic region, when he toppled into a pot of boiling water in Bayelsa State. 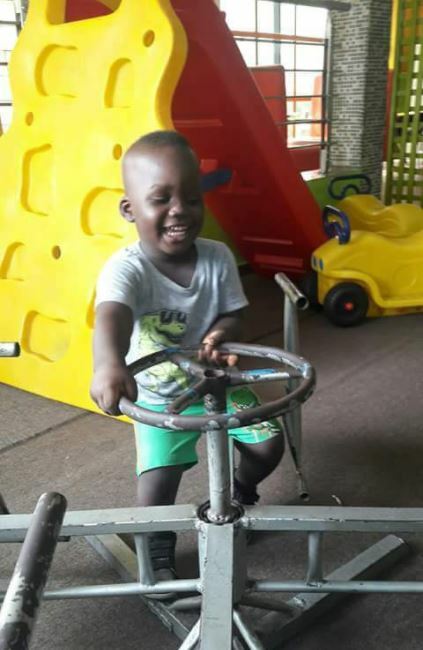 “Tomorrow my Son will officially turn 2, it will be a celebration of Joy. “Just few days to my son’s birthday, after I returned from a spiritual revival, I got a call three days later from the mother that he had fallen inside a hot pot of boiling hot water meant for the baking of Starch, kept outside of the Flat. “When I rushed down, the sight of my child forced tears down my eyes, in my heart, I cried to the heavens, he fell with his back, so he was burnt from his back, down his buttocks to his legs, also affecting parts of his pubic region, the affected regions were heavily swollen. “Immediately we took him for treatment and kept him on intensive care, that day it seemed my whole world had fallen apart, as I lamented and questioned how it happened, I became more angered. “The presence of my mum and dad who rushed down comforted me, and eased the tension and anger already boiling in me. “The next day, I took a sticker I brought from the Amaseikumor Festival, I placed it on my son and prayed, I prayed for all his pains to be taken away, I prayed for restoration, I prayed for quick healing, then I committed all to my God. I chanted AMASEIKUMOR!, my case will not be misery, every evil wind has been blown away. “The third day is the picture below, when I came to check on him, he had been strengthened, the wounds were drying up, he was now moving around, playing as usual. “As he clocks Two tomorrow, it shall be a celebration of life, I count all that has happened as part of my joy, I have been asking myself, what if he had fallen with his face? In all I give all glory to our God our Lord, who has been faithful. “Join me tomorrow, to celebrate my bundle of Joy as he adds another beautiful feather to his glorious wings, may your prayers don’t be endless towards his total recovery. “The celebration shall be very very low. “I thank all those who have been supportive with prayers and moral support, I am so grateful.